Another great show from the Wellington Improv Troupe is due to start soon, a nine week soap opera, and I’ve been having a bunch of fun making some publicity material for it. My bit of the project started with a half-hour photo shoot (that half hour included setting up the lights and photographing about 7 performers in different combinations). Then there was the real work of making online banners and icons, fliers and an A0 poster for the venue window. I love playing with retro design, but the 1980s when the show is set ain’t quite a classic era yet – the challenge was to evoke a ‘design essence’ of 1982, but not in such a way that it’s going to be mistaken for merely accidental old fashioned styling. The design also needed to let the possible audience know this will be more comedy melodrama than serious exploration of New Zealand education in the Muldoon years. 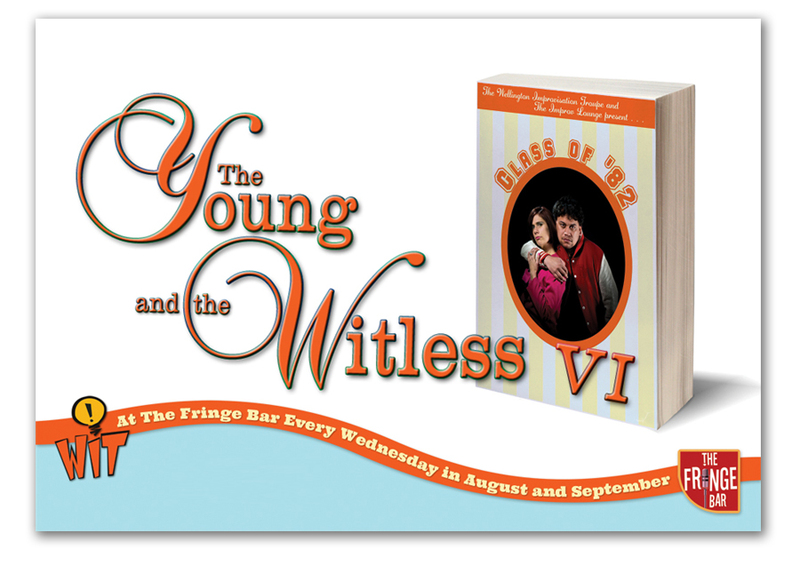 If you are in Wellington on a Wednesday during August and September, you should definitely come to the Fringe Bar and check out the poster show for yourself! This entry was posted in digital, photography, Photoshop and tagged design, graphic design, improv, improvisation, Photoshop, poster, posters, theatre, wellington. Bookmark the permalink. ← Instamorph? What is this Instamorph of which you speak? !